Mad Creek Books, 9780814254868, 296pp. Diagnosed with severe anxiety, PTSD, and OCD in her early twenties, Sarah Fawn Montgomery spent the next ten years seeking treatment and the language with which to describe the indescribable consequences of her mental illness. Faced with disbelief, intolerable side effects, and unexpected changes in her mental health as a result of treatment, Montgomery turned to American history and her own personal history—including her turbulent childhood and the violence she faced as a young woman—to make sense of the experience. 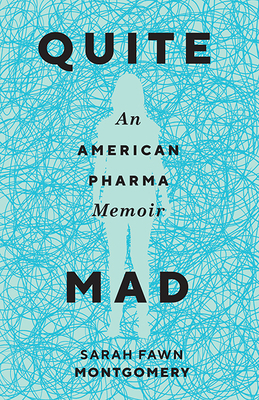 Blending memoir with literary journalism, Montgomery’s Quite Mad: An American Pharma Memoir examines America’s history of mental illness treatment—lobotomies to sterilization, the rest cure to Prozac—to challenge contemporary narratives about mental health. Questioning what it means to be a woman with highly stigmatized disorders, Montgomery also asks why mental illness continues to escalate in the United States despite so many “cures.” Investigating the construction of mental illness as a “female” malady, Montgomery exposes the ways current attitudes towards women and their bodies influence madness as well as the ways madness has transformed to a chronic Illness in our cultural imagination. Montgomery’s Quite Mad is one woman’s story, but it offers a beacon of hope and truth for the millions of individuals living with mental illness and issues a warning about the danger of diagnosis and the complex definition of sanity. Sarah Fawn Montgomery is the author of Regenerate: Poems of Mad Women, Leaving Tracks: A Prairie Guide, and The Astronaut Checks His Watch. She works as Prairie Schooner’s Assistant Nonfiction Editor and is an Assistant Professor at Bridgewater State University in Massachusetts.